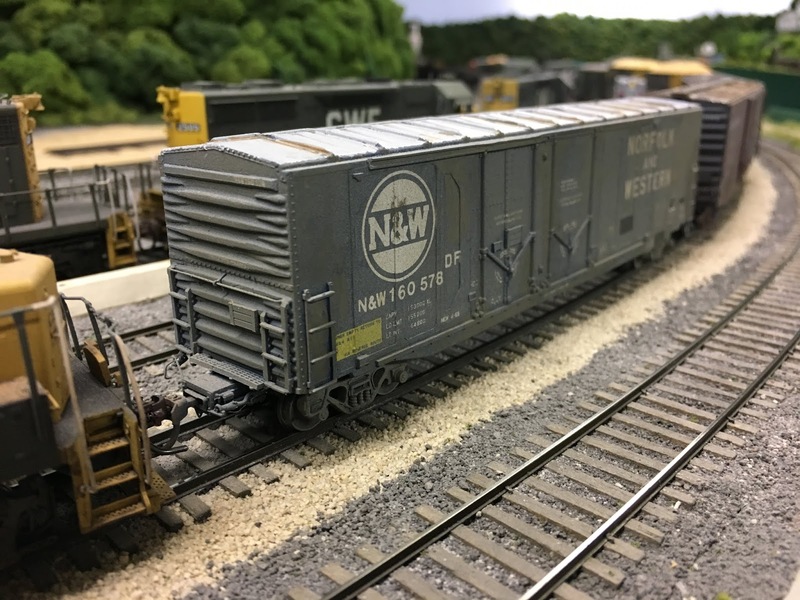 In this installment of Freight Car Friday, we'll look at N&W 160578. This was the first real kit-bash project I ever undertook and it was based upon two articles by Jim Eager in Railroad Model Craftsman in the early 1980's. In the November 1980 issue, Jim described how to modify the ends of the old Athearn plug-door boxcar to more closely resemble the ACF Precision Design plug-door car. He also detailed how to remove the rivets and replace them with weld seams. In the may 1981 issue, he went on to describe how to kit-bash a group of double door cars. I followed Jim's instructions to the letter. There were two significant modifications to the N&W car. The first was the addition of the second plug-door. 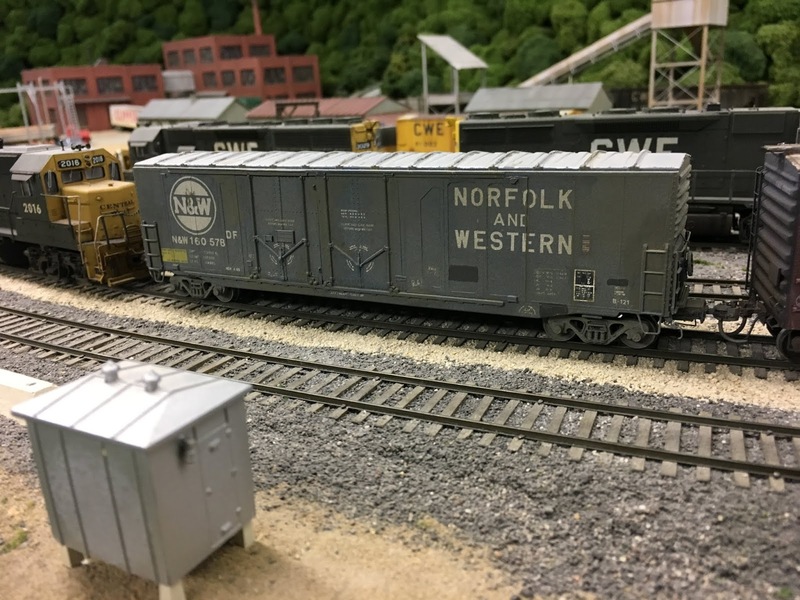 Jim described how to narrow an Athearn door that had been removed from another project from 8' -0" to 7' -0". The second big change was the addition of the reinforcement plates next to the doors. These were cut from .005 clear sheet styrene and glued in place. The door tracks were extended with pieces of styrene. The photo below shows the modifications to the sides. The modifications to the ends can be seen in the photo below. This car was completed sometime before 1983 and I'm not sure what I used as a reference for the car color. The photos in the article were black and white. I mixed up the N&W blue from Floquil paint that I had on hand and lettered the car with Microscale decals. I also weathered the car using thinned Floquil and lacquer thinner. I'm surprised it turned out as well as it did. I originally thought I had overdone the weathering, but I now think it fits in pretty well with the rest of the fleet. I may go back at some point and re-weather the trucks, but for now, the car just keeps racking up the miles on the railroad.